Thread: US Henchmen Violently Arrest Assange! Show Trial To Follow. When 5 million people show up at the court house to protest, it might be kind of difficult to convict. That’s optimistic. I’d expect more like 50. Trump trying to distance himself from Wikileaks after praising and even asking for their help during the campaign. "I know nothing." That's optimistic. I'd expect more like 5. Trump today said he doesn't even know what Wikileaks is. He won't pardon Assange. Assange is no longer useful to him so like many others he has been dropped and designated "persona non grata". Trump today said he doesn't even know what Wikileaks is. You are fake news, a liar and a scumbag constantly peddling the establishment narrative. It is obvious you have no desire for anybody to have any factual or truthful information. Trump did not say he didn't know who they were. He said he didn't know anything about them. What he obviously meant was he didn't know what was going on with them currently, or that he didn't have any information about wikileaks about the arrest. Wikileaks very much was his thing during the campaign. the arrest and likely extradition of Wikileaks publisher Julian Assange, who was literally sold out for the proverbial 30 pieces of silver (or in this case it was a $4.2 billion IMF loan to Ecuador approved just last month)! Vice President Mike Pence was in Ecuador last June to push a quid pro quo with the recently elected Ecuadorian president, Lenin Moreno: You hand us Assange and we'll make sure you get your loan. the extradition of Assange to the US will not be to carry out justice, but rather to carry out an old-fashioned show trial. Anyone who's read the history of Soviet show trials in the 1930s - or even read Arthur Koestler's masterpiece Darkness at Noon - understands they are not at all about meting out justice or punishing those convicted of a crime. The purpose of a show trial - and Assange's will be no different - is pour encourager les autres: to ensure that any future journalist who considers publishing material embarrassing to the state or exposing real state crimes will quickly perish the thought. Lest he or she perish. Of course it is not about hacking. Any journalist cultivating confidential sources provides assistance to the source in getting the material. From teaching basic encryption or other methods, this is common practice. After Assange there is very unlikely to be more Assanges. We will never know the crimes committed in our name in places like Syria, Venezuela, and elsewhere on the neocon map of future atrocities. And that's the point. Moreno started to crack down on and encourage Assange to leave pretty much as soon as he took office- starting with cutting off his internet in 2017. Ecuador said it spend $6.2 million to take care of Assange and he wanted him to leave. Pence did not meet with Moreno until June, 2018. Wikileaks posting private photographs and information on Moreno helped encourage the eviction. Tonight both Chelsea Manning and Julian Assange are in jail, both over offences related to the publication of materials specifying US war crimes … No matter what bull$#@! political and MSM liars try to feed you, that is the simple truth. 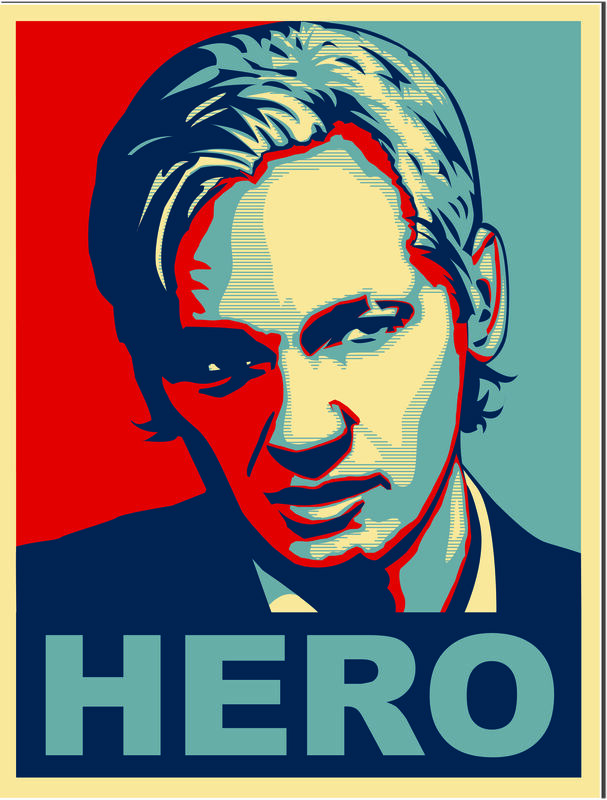 Manning and Assange are true heroes of our time, and are suffering for it. So what?? The releases pertained to his campaign during the campaign. Now he is concerned with other things. Looking pretty likely that Assange will be dead soon. "If a nation expects to be ignorant & free, in a state of civilisation, it expects what never was & never will be. The functionaries of every government have propensities to command at will the liberty & property of their constituents. there is no safe deposit for these but with the people themselves; nor can they be safe with them without information. Where the press is free and every man able to read, all is safe". the Trump administration’s extradition request is accompanied by criminal charges which are based on the same information which the Obama administration declined to charge Assange … discussed in more detail in a new article by The Intercept‘s Glenn Greenwald and Micah Lee. The Obama administration looked at the evidence and concluded that there was no way to charge Assange with anything without endangering press freedoms, then the Trump administration looked at literally the exact same evidence and said screw press freedoms, … They wanted to punish Assange and show the world what happens to a journalist who exposes US war crimes, so they changed the narrative to make it happen. But they couldn’t extradite Assange from the UK if the British government didn’t legally have Assange in custody. To get around this problem, the UK, which is functionally just a province within the US-centralized empire, used a bail technicality to justify his arrest. After the Swedish government decided to drop its sexual assault investigation without issuing any charges … The judge in that case, Emma Arbuthnot, just happens to be married to former Tory junior Defence Minister and government whip James Arbuthnot, who served as director of Security Intelligence Consultancy SC Strategy Ltd with a former head of MI6. Lady Arbuthnot denied Assange’s request with extreme vitriol … The British government kept police stationed outside the embassy at taxpayers’ expense with orders to arrest Assange on sight. In this way a kind of narrative funnel was created, funneling Assange from the embassy to British police … for a bail violation … to be funneled from the UK into the US on the imaginary narrative that he broke some kind of law by trying to help Chelsea Manning cover her tracks and avoid detection … And the end result just so happens to look the same as what you see when a journalist tries to expose malfeasance in an overtly totalitarian government. This is called Nice Guy Fascism. … narrative manipulation … to act just like a brutal totalitarian regime and then say it’s not because you’re a brutal totalitarian regime … No one is above the law. No one is above the law. No one is above the law. They keep saying “No one is above the law,” but what they really mean is “No one is safe from the law.” Our rulers are using Assange to show that they can get anyone who tells the truth about them, even if there are laws and policies in place which ostensibly prohibit that. They want you fixated on … “the rule of law” … series of mental narratives which are treated as reality by existing power structures. 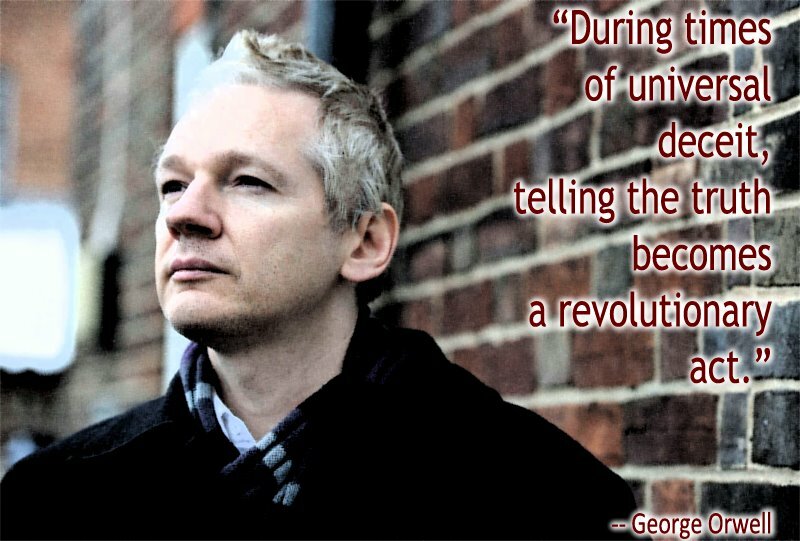 Assange is a prisoner by narrative, because he punched holes in the authorized narratives of the powerful. Whoever controls the narrative controls the world. Most days are sad days for freedom. The last few days were especially so. Was it not once considered patriotic to stand up to our government when it is wrong?" Whistle-blowers are the truth-seekers, and we must demand the truth. Who does not want to know the truth? Sadly, in an empire of lies, the truth has become treason."